Oscar Pistorius will be evaluated at a psychiatric hospital for one month so that doctors can assess his mental state when he killed his girlfriend Reeva Steenkamp, a South African judge ordered on Tuesday. The paralympian star must visit Pretoria's Weskoppies Mental Hospital, where he will be assessed every weekday for 30 days, Judge Thokozile Masipa told his murder trial. Pistorius admits shooting model and law graduate Steenkamp while she was in the bathroom of his luxury home on Valentine's Day last year. The prosecution said he murdered her after an argument, but Pistorius denies this and says he thought she was an intruder. 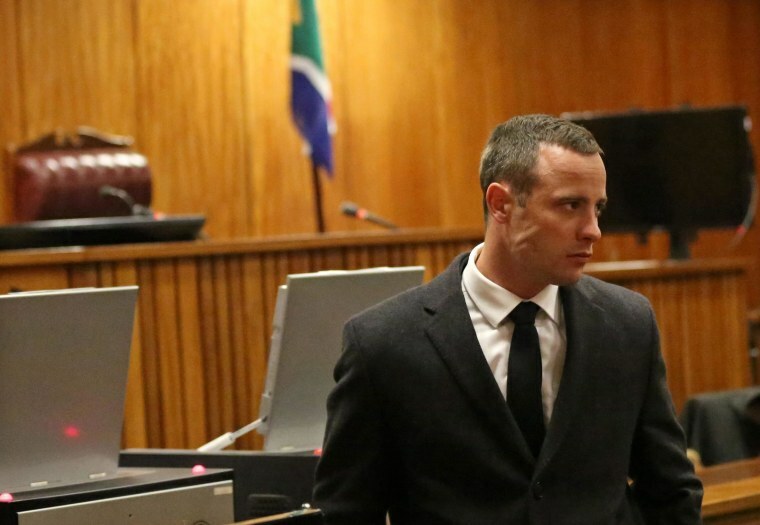 The trial will be postponed until June 30 while Pistorius undergoes evaluation by four doctors at the hospital in South Africa's administrative capital city, starting May 26. He will be released and allowed to return home at 4 p.m. each day. The development came after Judge Masipa on Wednesday approved the prosecution's request for a psychiatric evaluation after a doctor testified that the athlete suffered from "anxiety disorder." Dr. Merryll Vorster told the court this condition could have been caused by various events in Pistorius' life, such as the amputation of his lower legs as a baby and his late mother's habit of sleeping with a gun under her pillow. Prosecutor Gerrie Nel had claimed Vorster's evidence suggested Pistorius' lawyers were preparing a defense based on mental health conditions and asked the judge to send Pistorius for an independent assessment at a state hospital. Granting that request, Judge Masipa said: "Mental illness and mental defects are morbid disorders that are not capable of being diagnosed by a lay court without expert psychiatric evidence. "The evidence of Dr. Forster has not been contradicted nor can it be in the absence of other psychiatric evidence," she added. "This court is ill-equipped to deal with the issue raised in Dr. Forsters evidence at this stage." Masipa stressed that the ruling was not meant to "punish" Pistorius.